NOTE: Part of newsletter sent to my subscribers on 26th of August 2015. Since my last email yesterday, a lot of questions started coming on the directional conservative strategy of my course. India VIX at 25.52 – What to Trade? The directional strategy needs VIX to increase not decrease. So I would suggest do not trade this strategy right now. Wait till VIX gets below 20. But on the other hand itâ€™s amazing time to trade strategy 1. 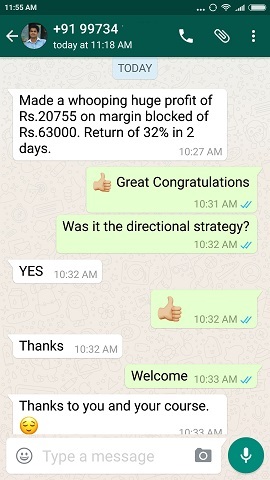 Frankly even if the strategy hits stop loss you will end up making a profit because VIX is dropping. It dropped today by 5%. I assume it will keep dropping, though not in a regular manner but within next 20-25 days, it surly will be below 20. Probably before that. Nifty has crashed. People sitting on cash, please buy some blue chip stocks for good and quick profits. And always own some quality stocks forever – these will take care of your retirement. Some stocks should never be sold. For example if you buy a stock at 25 and it goes to 50, and then you sell them thinking you will buy again at 40. Then it may come down to 41, and go back to making a century and you will miss a great opportunity to make money. So these stocks should be sold on your 60th birthday. That’s the best gift you can give yourself on that day. Then invest the money in a liquid fund that gives around 9% per year and enjoy your retired life. And yes keep some cash for trading. This money is in your control. Grow it slowly too. Can you see how the risk is divided? Traders should keep some cash in hand for these kinds of opportunities. 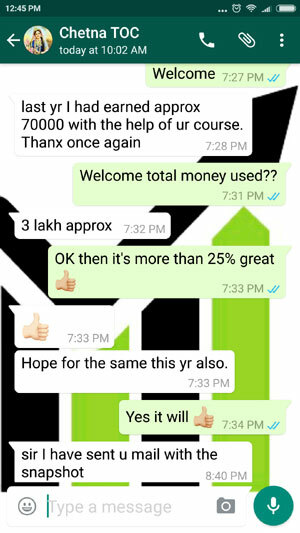 You should also know about covered calls when buying huge quantity of shares for monthly income. 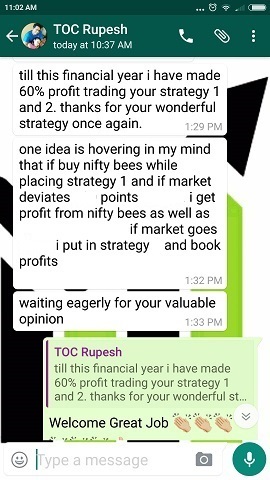 Disclaimer: Just because I am saying, DO NOT buy Nifty Futures. Please do your own research before doing any strategy. Please understand that Futures have an Expiry and MTM (Mark to Margin). Nifty will not travel to that distance in a smooth path. It may go down, you will take your stop loss or be forced to exit the position by your broker or because of expiry. And then Nifty may start moving up again. What I am trying to say is, this is how markets move over time. The path it takes is rough, so predicting gets really difficult. I am predicting what will SURLY happen in near future – but I do not know when. So people who have done my course can take a calculated risk based on what may happen in near future. Not tomorrow or day after – but say within the next few weeks. Moreover we are more bothered about VIX, NOT Nifty’s direction. NOTE: Part of newsletter sent to my subscribers on 27th of August 2015. 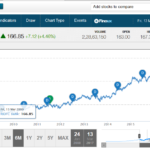 As written on 26-Aug-2015, at the time of writing Nifty is already up by more than 120 points and now is at 7915 – less than 100 points away from 8000. INDIA VIX is also down by 13.28% and is at 22.13 – a drop of 3.39 points. Like I said yesterday, that VIX and Nifty are inversely proportional. Since VIX was starting to drop, there was a huge chance that Nifty will rise and try to get back to normal range – exactly that’s happening today. But understand that the path will not be smooth. Nifty can again fall and rise, the point is usually markets overreact and then settle down to its normal behavior. We should know this and try to take benefits of these situations. If you remember I had asked to do a Bull Put Credit Spread on a few stocks a few days back and all of them are much above those levels. This is how you can read markets and take a calculated risk. I am not saying that every time you will be correct, but over time you will see that what you expected has happened. On top of that all trades are also hedged, so even if we take a stop loss the loss will be so small that it wont hurt our trading accounts. People with no patience and aggressive naked trades are the ones who keep loosing. People who take a calculated risk with proper hedging are the once who succeed most of the times. NOTE: Part of newsletter sent to my subscribers on 28th of August 2015. As expected Nifty has crossed 8000 and is currently at 8075. INDIA VIX again dropped by almost 5% and is at 20.95. Very soon it should drop below 20. China slowdown was an overreaction and those who jumped into the markets to buy quality stocks got a return of more than 10% in 3-4 days. That is why you should always keep some free cash to buy quality stocks whenever markets’ crash. Since now all of these stocks have moved up, the credit spread must be closed in profits. There is no need to wait till expiry as the profits have come very fast. Free cash to get into better trades. It looks like VIX will drop till 17-18 and stabilize until some good/bad news hits and it goes up again. Great time for option sellers. Good time to trade Strategy 1 of my course. Please suggest some good stocks to buy and hold during this crisis. I don’t suggest any tips whatsoever, but I do give ideas. Some stocks are already mentioned in the above post. These I am sure should give a return of more than 5% in a couple of months if you are willing to hold. Disclaimer: Please do your own research as well before buying them. Salute to you Dilip and your thoughts.. 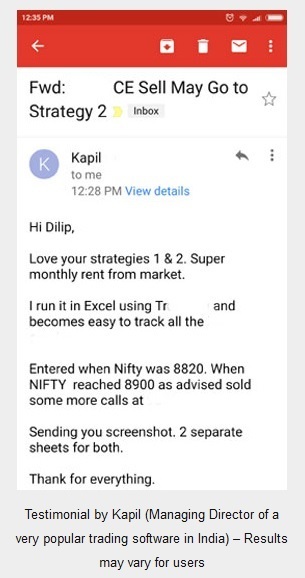 I sold 8000 put September at 300 and bought 7800 put @ 135 September series on Monday… And you endorse it in your email too…thanks to your teachings will join your course soon. You should book profits on Monday. VIX has dropped considerably and Nifty has also moved up. So if you are making a reasonable profit – exit the trade. Remember the profits has come pretty fast so there is no need to wait till expiry. A winning trade may be a loser on the expiry day. So on Monday if you are making a profit exit. Thanks for mail just want to know what is VIX? It is a measure of fear in the markets. When there is a bad news and markets fall, VIX increases and option premium also increases. When everything is fine and all is good, VIX drops, Nifty rises and option premium decreases.